What could be more beautiful than the natural look of wood? 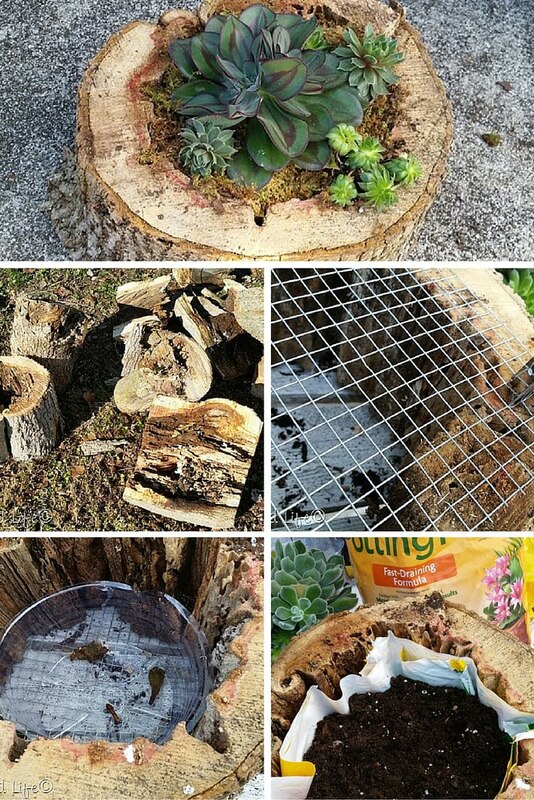 These wonderful tree stump projects let you create useful tables, wall art, cutting boards and more. Of course, one of the best benefits of making a DIY tree stump table is that you’ll have the satisfaction of creating something of your own. Your one of a kind item will not only be unique, but it will also be beautiful. These items are not difficult to make, but they do take some time and might even call for the use of power tools. If you plan on putting a sealer on your project, make sure that you let the stump sit in a dry place for several months. The wood needs to be completely dry before you seal it in order to prevent large cracks from forming. A tree stump that has been stripped of its bark makes a unique and attractive side table. Finding a durable table that can stand up to daily use is tricky, but with a natural wood stump, you’ll certainly have a very durable table. With the addition of wheels, you’ll even be able to easily move your tree stump table from place to place. Check out how you can make one of these tables yourself. When you want a fun beachy feel, this cute tree stump table certainly fits the bill. This table would look adorable on a sun porch or patio as well as in your living room, and the white top gives it a bright, clean look. Follow the tutorial to create this great looking table. Who wouldn’t love the look of this gorgeous tree stump side table? It’s gloss finish gives it added warmth while letting the natural grain of the wood shine through. The perfect side table that will look great anywhere you decide to use it. You’ll find all the instructions you need to complete this project. A natural log makes a unique lamp base. It’s easy to wire using parts from an old lamp, and you’ll have a lamp with a great deal of style. Follow the instructions for this gorgeous lamp. Make a wonderful pair of accent tables using some old metal chair legs and a couple of slices of wood from a dried log. These tables add an interesting and unique touch to any room. Easy to follow directions make this a wonderful project for just about anyone. If you’re looking for an easy DIY project, this gorgeous serving board is a great choice. In fact, this serving board is so easy, you don’t even have to cut your own log. Just purchase the wood from a craft store and follow the easy directions. These stools are incredibly fun. They’ll definitely be a conversation starter! Of course, you can choose any type of print or solid color fabric for your cushions, giving each stool its own unique look. See the tutorial for more information. This table is versatile. You simply select the legs you want to use, then calculate how tall your log needs to be in order to sit at the height you desire. Every log is unique, which will give your table a lot of character. Check out the tutorial. What could be easier than making an attractive wall arrangement from thick tree branches. The different diameters of each branch segment as well as the varying heights adds a great deal of interest to this unique wall art project. Take a look at the instructions to get started. A beautiful table made from a slice of tree can add a great deal of interest to any decor. This lovely log slice table lets you see the rings of the tree, and the multiple coats of polyacrylic help to prevent stains and marks on your table’s surface. Find easy directions for this table. When you want something a bit more than a side table, these beautiful tables come together to create a very versatile dining room table; but, you can also separate each table to use individually. Arrange the three tables in a grouping for a fun dining room table or line the tables up to use for a party or during the holidays. Follow the step by step directions for excellent results. This table has some very special touches, such as the chamfering or little ridge around the edge. It also keeps the natural bark in place and is simply sprayed with a clear sealer to keep its natural beauty. Just add some sturdy legs to give the table the height you desire and you’re all set. The directions are easy to follow. This table is truly one-of-a-kind. You’ll only need a thick disc of a tree stump in order to make this table. The polyurethane coating gives it a nice sheen, and the beautiful table legs add plenty of their own style. You’re going to fall in love with this table. Just follow the simple steps. 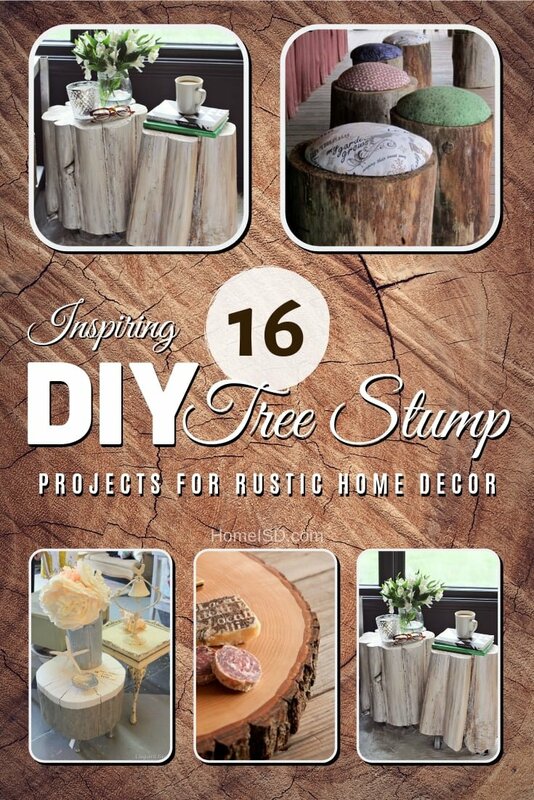 If you like original decor then this rustic centerpiece will be your DIY project. Decorate simple planter pots with faux wood texture and use a wood slice as the base. It can’t be easier than that but the end result is remarkable. Creating the right mood on those long and chilly autumn evenings is really what it’s all about. And that’s exactly what you get when you combine rustic tree stump accents and mood lights of candles. It’s a fun project to make this planter repurposing natural materials like a rotted tree trunk. Check out the tutorial for step by step instructions.